Our friends over at 50 Fifty Gifts have given us 2 Space Invaders money boxes and 2 Space Invaders alarm clocks to give away! Here they are, good luck! Disclaimer - no payment or products has been received in return for this competition. I love the alarm clock, though they are both rather good! I would want both..I am greedy. The Space Invaders Alarm Clock for my son. I would love the money box as I am trying to teach my children the value of money and saving! I would love the alarm clock for me and my fella....Need something to help us get up on these dark mornings! I would love to win this as I have an alarm clock but it seems to have a mind of its own. 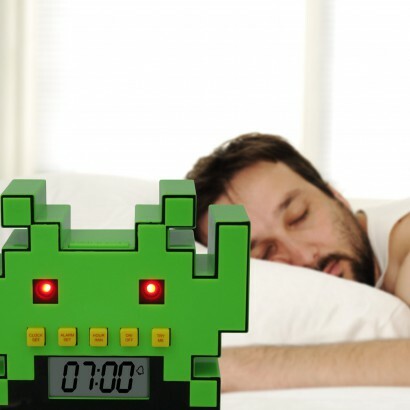 Space Invaders alarm clocks - hubby would love this! I would love to win the moneybox for my son! He wants a moneybox like his sister! The Alarm clock for my 17 year old son. He may actually pay attention to it, with it being retro-gaming inspired! Alarm clock for me to replace the one I've just broken. Id love the alarm clock for my husband, he is a real retro game fan. We have boxes (and I am not exaggerating) full of cables.. of which he claims "They don't make them anymore!" - Yes.. because they are prehistoric!! haha. We have an original Atari, with a game the children call glagalaglag (Keystone capers) and ofcourse space invaders on that. Not just that but when we get a new console, for example when we got the PS3 (After much debate over the game quality) the first thing he downloads is a retro gaming bundle!! Now he is very exited over the Wii U console - as through its online shop you can download all previous consoles games, NES/SNES/Dreamcast.. He likes this.. so he doesn't have to rig up his babies, thus preserving them for the grandchildren!! His legacy! My brother-in-law would love this! Sorry missed off the money box! I'd love to win the alarm clock for my husband as he never uses one. It would help him be on time! I would LOVE to win the space invader money box for my partner , he leaves his change everywhere ! so this would make a fabulous xmas prezzie. I'd love the alarm clock for my fella. He keeps moaning that we don't have a cool alarm clock. I would love to win the alarm clock for my brother! He is a big gamer and loved space invaders! My son has asked for a new alarm clock for Christmas so this would be for him! Oh my goodness these are great, it would have to be for my brother who was mad on space invaders - the alarm clock but both look great! I would like to win the alarm clock - for my hubs - so that he will switch his phone off at night (and the alerts stop waking me up)!!! the alarm clock for my boyfriend he would love it! the alarm clock for my son! 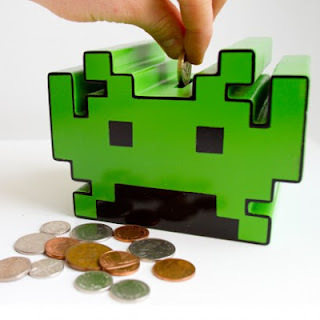 I'd like to win the money box for my nephew, he's a big Space Invaders fan. The alarm clock for my grandson. Would prefer the clock please! But my son would love either! the money box for my nephew who is sick and tired of having my husband regale him with stories of "when I was your age, I wanted an Atari" etc etc etc. I would love the alarm clock for my son because he is a nightmare to get up in the mornings for school! The alarm clock for my husband - he loves retro computer games! I would love to win the alarm clock for my son....he may stay in bed a bit longer then! the alarm clock for myself!! I would like to win either. Of I won the alarm clock, I would give it to my older nephew and if I won the money box, I would give it to one of my younger nephews. I'd love the money box to try and encourage my husband to put his change in it rather than leave piles of coppers on every surface! I'd like to win the alarm clock for my boyfriend, he's just a big kid at heart and would love this - it would remind him of his youth! My husband would love either of them - he's a huge Space Invaders fan! The moneybox would encourage him to save his change though instead of leaving it lying around everywhere. I have the t-shirts to match... what an accompanyment! I'd love to win the money box for my big kid of a partner - he's 25 but would love it! The alarm clock for my brother he would love it! The clock I think for my son. The clock for my brother as he is still stuck in the 80's! The alarm clock to wake up my boyfriend! I would love to win the money box and i would give it to my little brother! I would LOVEE to win the alarm clock. I am sick of us being late for school :'( And it is VERY cool looking!! I would love this for my son .. he always thinks he finds the best new gadgets so i would love to surprise him with this!